These days, though I seem to get more and more of my news through Twitter, I haven’t yet been able to ditch RSS, in large part because there’s something about it that still feels comprehensive. 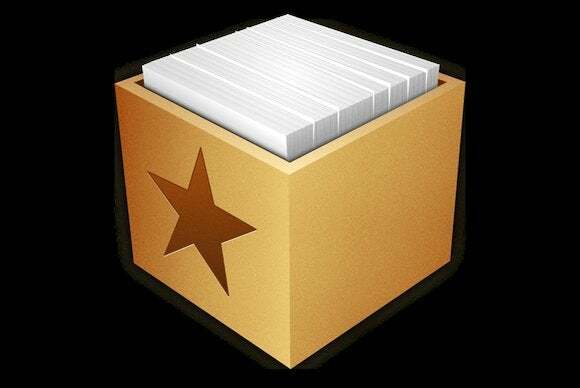 Still, I’ve been looking for a better RSS experience on my Mac, and I’ve alit upon Silvio Rizzi’s new Reeder 2 for Mac ($10; Mac App Store link), an update to the original Reeder for Mac. Built around a multi-paned interface, Reeder presents a logical hierarchy of RSS: At the far left are your accounts—you can connect to one or more feed-syncing services such as Feedly, Feedbin, FeedWrangler, and Fever. (You can also, if you prefer, use Reeder without using a sync service, as long as you don’t need to sync between multiple devices.) For each account, you can specify settings such as the frequency of retrieval, how items are marked as read, subscription sorting, and more. Reeder's dynamic, multi-pane interface keeps the content you care about close at hand, while hiding the stuff you don't immediately need. In the next pane from the left, you’ll find a list of the feeds in the selected account, organized within any folders you’ve created. Individual feeds show up with their favicons, if available, and folders can be collapsed or expanded by clicking each folder’s disclosure triangle. Select a feed (or folder), and the next pane shows a list of articles in that feed (or folder). Selecting any individual news item hides the account pane (which most people rarely need to access), giving you a three-pane interface with the selected article displayed on the right, in the widest pane. If you want to see the original article on the source website, clicking the feed item’s headline loads it, by default, in a new pane on the right, sliding the current account’s list off the screen. Using this sliding-pane approach, Reeder manages to maintain a consistently sized window while still giving you space where you need it. One of Reeder’s best-implemented features is easy and customizable access to 15 different sharing options. 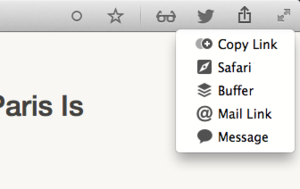 Two other features that are particularly well implemented in Reeder are sharing services and keyboard shortcuts. In the case of the former, Reeder supports 15, by my count, not including Copy Link and Open In Safari. But what I particularly enjoy here is the capability to display only the ones I actually use. Additionally, Reeder lets you choose which of the enabled services get their own dedicated icon in the app’s toolbar (as opposed to hidden in the sharing popover), so you can put your most-frequently used services just a click away. Even better, however, is the convenience of keyboard shortcuts. Interestingly, most of Reeder’s shortcuts don’t require modifier keys—for example, A is the shortcut for Mark All As Read. Initially, this approach seemed anathematic to me, but as I’ve used Reeder more and more, I’ve realized that these single-key shortcuts greatly speeds my feed reading: It’s easy to quickly flip through unread items via the keyboard, starring items or marking them all as read without lifting my hands from the keyboard or contorting them to press modifier-key shortcuts. And, as you might expect, shortcuts for all of Reeder’s own actions—including triggering external services—are eminently customizable. 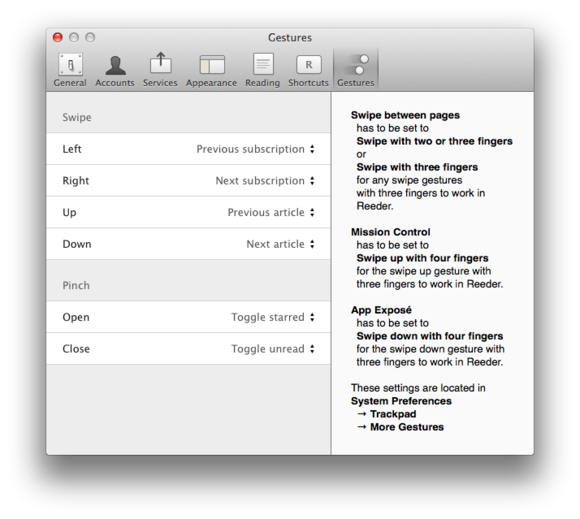 Reeder offers plenty of customization options for gestures, though doing so requires tweaking OS X’s preferences. If you’re coming from the iOS side, you’ll likely appreciate Reeder’s handy support for gestures. In addition to swiping between panes, Reeder lets you configure multi-finger gestures for a whole host of actions, including switching between subscriptions, toggling full-screen mode, and even triggering specific sharing services. The downside here is that in order to use this feature, you’ll need to make sure that OS X’s trackpad settings are specifically configured so as to not interfere with Reeder’s gestures. I happen to like the way I’ve got my Mac configured, so I had to settle for using only Reeder’s pinch-in and pinch-out gestures, which I use to toggle unread and starred status, respectively. Reeder is definitely an acquired taste, especially if you—like me—have been reading RSS feeds since the heyday of NetNewsWire. But while it may not have every feature under the sun, it does a good job of streamlining the RSS experience—I don’t constantly feel overwhelmed by the sheer amount of content available. 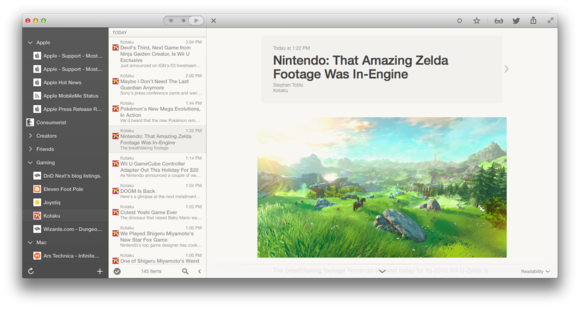 If that sounds like the kind of RSS you want to deal with, Reeder might very well be the app you’re looking for. For those who don't need advanced features, Reeder 2 lets you quickly and easily read your RSS feeds. Gesture control and support for plenty of sharing services give the app polish.